The initial equilibrium is with real output at $Y_0$,the price level at $P_0$ and the rate of interest $r_0$. 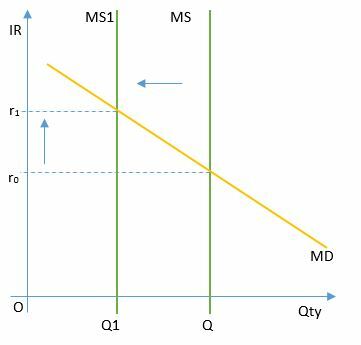 An increase in the rate of interest to $r_1$ will need to be balanced by a decrease in money supply to maintain money-market equilibrium. The illustration below accompanies the claim. How/why does the money supply shift leftwards to accommodate a return to "money-market equilibrium", and what is such an equilibrium to begin with? Additionally, is this shift automatic or is it one where the government must intervene? The graph is a little misleading. Imagine the interest rates increase without $MS$ shifting to $MS1$. Here the demand for money is less than the supply, so there is a surplus. If the MS does not shift, eventually the interest rate will fall again until the shortage is no longer (we are back in equilibrium). If the Fed wants to maintain the higher interest rate, $r_1$, it also must shift $MS$ to $MS1$. Not the answer you're looking for? Browse other questions tagged interest-rate money-supply or ask your own question. How does changing the Bank of England base rate work?